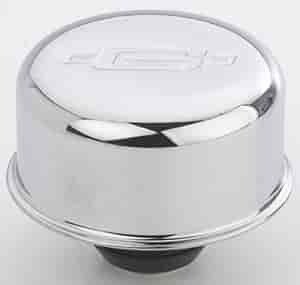 Replace your rocker cover PCV valve with this chrome plated performance breather. It has a 3/4'' O.D. mounting tube, internal oil baffle with polyurethane filter element and features the Mr. Gasket logo embossed on top. Chrome-plated breathers feature metal baffle/foam elements, either with or without a PCV hookup tube. There's even a model to replace your PCV valve. Fits 1-1/4" hole except as noted. Grommet included. 2057 - Mr. Gasket Chrome Valve Cover Breathers is rated 4.0 out of 5 by 1. Rated 4 out of 5 by Mako from Mr. G breather. Fit my billet valve cover perfectly and relieved the pressure in the valve train.